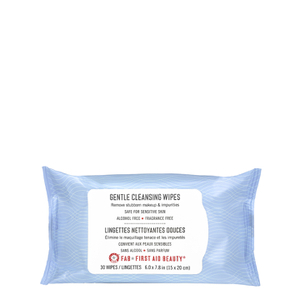 Perfect for on-the-go lives and busy schedules, the First Aid Beauty Gentle Cleansing Wipes combine chamomile, aloe, and bisabolol to gently yet effectively cleanse the skin of makeup, impurities and surface oils. Soothing and refreshing, use these face wipes after the gym or as part of your daily cleansing routine to instantly refresh the skin and combat free radical attacks without greasy residue. Ideal for all skin types and fortified with botanical antioxidants. - K.N. *Free from parabens, harsh chemicals, colourants, alcohol and oil. Safe for sensitive skin. For use any time of day. Gently wipe face with towelette to remove all makeup and impurities. No need to rinse. Reseal label. Water/Aqua/Eau, Butylene Glycol, Cucumis Sativus (Cucumber) Fruit Water, Aloe Barbadensis Leaf Juice, Disodium Laureth Sulfosuccinate, Sodium Phytate, Cocamidopropylamine Oxide, Propanediol, Camellia Sinensis Leaf Extract, Glycyrrhiza Glabra (Licorice) Root Extract, Chrysanthemum Parthenium (Feverfew) Extract, Bisabolol, Caprylyl Glycol, Phenoxyethanol, Chamomilla Recutita (Matricaria) Flower Extract, Glycerin.